Montefiore, the academic medical center and University Hospital for Albert Einstein College of Medicine, is nationally recognized for clinical excellence—breaking new ground in research, training the next generation of healthcare leaders, and delivering science-driven, patient-centered care. 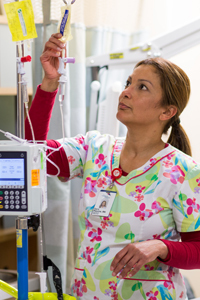 Montefiore nurses are integral members of the interdisciplinary patient care team and are recognized for their unique, binding role. Partners in every sense of the word, our nurses work closely and collegially with physicians and other professionals to maximize outcomes and steer our constituents to a healthy, productive future. Our patients’ best interests—often long after they leave the hospital—are always a foremost concern. Nursing care at Montefiore doesn’t stop at the bedside. Our commitment to our greater community is deep and unwavering. We promote healthy behaviors through programs rooted in ongoing population health assessments and discussions with key community stakeholders. In doing so, we not only advance the well-being of the communities we serve but also rise to the global challenge of delivering accessible and high-quality healthcare. In 2012, Montefiore’s nursing team grew by 264, to nearly 2,700 RNs representing more than 50 disciplines. Montefiore’s nurses are highly educated and experienced: 53 percent have a bachelor’s degree and 18 percent have earned a master’s degree. Most nursing leaders have master’s degrees, 18 are pursuing doctoral degrees, and 19 serve as adjunct professors. The staff includes nearly 300 advance practice nurses, 109 nurse practitioners, five midwives and five certified registered nurse anesthetists. If you desire to make a difference, aspire to new professional heights, and want to work with the best and brightest in medicine, Montefiore may be the perfect fit for you. We invite you to learn more about Montefiore. Explore nursing employment opportunities. 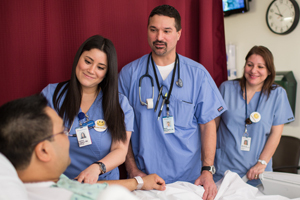 Discover for yourself what distinguishes a nursing career at Montefiore—and the many ways in which we are constantly striving to advance care for our patients and the profession as a whole.